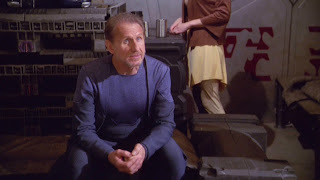 The crew of the Enterprise find what they believe to be an abandoned starship that they can scavenge for parts and then meet its ghostly inhabitants. We start of having dinner with an alien of unknown origin named D'Marr who's completely unimportant to anything except that he passes along information to Archer and the senior officers. ...Hm... That would make a good band name. Live from Deep Space Station K-7, Archer and the Senior Officers! See that? See how that picture and caption have absolutely nothing to do with the episode? That's exactly how much D'Marr matters. We could have just run into the abandoned ship he tells us about on our own. Then we wouldn't know that it's supposed to be haunted, and the episode would be better for it. As it stands, we are now bracing ourselves for a haunted ship that couldn't possibly be haunted. Without D'Marr, we would have shuttled down to a ship that couldn't possibly be haunted, but we believe to be haunted. We don't even see D'Marr leave. It cuts to the theme song and we come back without D'Marr being there. And looking down on an alien planet that's pretty much unable to support life. They walk into the ship and start taking what they need. And they completely destroy the haunted ship premise. They see one or two flickers of "ghosts," make a little joke about Travis and his "famous ghost stories," and suddenly they find real people living in a little oasis surrounded by a dampening field. Seriously, if you're going to introduce the idea of a haunted ship, why not stretch it out a little? They then meet Liana and a very familiar-looking man named Ezral. Actually... it's his voice that gives it away. "You were attacked by marauders with large ears, you say? I knew a bartender once..."
Well, once the cover is blown on their whole "ghost ship" operation, they ask Archer and the crew for some help with repairs to some vital systems. And, of course, they're always willing to help. And, as might be expected, Liana falls head-over-heels in love with Trip who heads up the repairs. And T'Pol is... jealous?? I mean, she hides it well, obviously, but it's pretty clear by her sarcastic tone that she's annoyed by Liana's relationship with Trip. And then Liana asks for a tour of the Enterprise. Ezral doesn't like it, but she eventually gets her way. And Trip is her guide. Then they find a corpse in an escape pod that's the same body as a person down on the "abandoned" ship. Really? Really?? You just ruined the ghost-ship premise for us and now you're going to try and bring it back? In either case, the mystery deepens as the crew not only have to figure out why there appears to be two of the same person, but they also figure out some discrepancies in the story they were told, such has how long they'd been there. True to Vulcan form, T'Pol figures it out, but before she's able to tell anyone, she's captured by Ezral and his crew. They also force Trip to keep working on their systems like a prisoner. Obviously, Archer is having none of this. He sends a team down to rescue TriPol, but when they shoot their phase pistols at the bad guys, the beam goes right through them without affecting them. At this point it's pretty clear that they're holograms. Which is further proven when Liana gives in to masculinity of Trip and removes the holographic programs from the computer, effectively making the hostiles disappear. "Help my friends and I'll give you a baby." Turns out Liana and Ezral were the only two real people there. Ezral programmed the community so that Liana could grow up to live a normal life after they crashed on this planet 21 years ago. Archer, however, convinces Ezral that Liana might not want to live in the same place forever. She needs to get out and explore. Ezral is happy where he is, but agrees what's good for him may not be good for Liana. And they all lived happily ever after and learned a valuable lesson about manipulating the phase variance of photons contained by force fields thereby constructing holomatter by use of a holographic projector. The only good thing to come out of this episode was another hint at T'Pol's true feelings toward Trip. She obviously loves him and was totally jealous of Liana. Trip is the reason she stays on the Enterprise instead of going back to Vulcan and Trip is the reason she broke it off with her Vulcan fiance. That's my story and I'm stickin' to it.